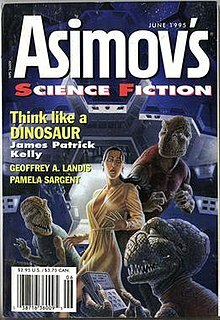 The story won the 1996 Hugo Award for Best Novelette, the Asimov's Reader Poll Award, and the SF Chronicle Award. It was also nominated for the Locus Poll Award, the HOMer Award and the Nebula Award. It was read by Michael O'Hare for Sci-Fi's Seeing Ear Theatre. The story postulates a transportation device (supervised by a dinosaur-like race of aliens) which can transmit an exact copy of a person's body to distant planets. The original body is disintegrated once reception at the destination is confirmed. In the story a woman is teleported to an alien planet, but the original is not disintegrated because reception cannot be confirmed at the time. Reception is later confirmed, and the original, not surprisingly, declines to "balance the equation" by re-entering the scanning and disintegrating device. This creates an ethical quandary which is viewed quite differently by the cold-blooded aliens who provided the teleportation technology, and their warm-blooded human associates. This page was last edited on 17 November 2018, at 23:47 (UTC).